If your kids enjoy play acting, they may love being a puppeteer! A puppeteer is someone who controls the puppets in a puppet show. Puppet shows have been popular with kids for centuries and many kids nowadays are still fascinated with puppets and how they work. Encourage their imagination by letting them play puppeteer in their own puppet theatre! Your kids may like to become puppeteers really soon. You will need some socks and a bit if sewing work and all done! Your kids will love playing alone or with friends! Will Your Kids Enjoy Playing the Puppeteer? Does your child have an active imagination? Do they love using their hands? They will probably love being a puppeteer and putting on a puppet show. Playing with puppets is one of those kids’ activities that can keep your kids busy for hours and it is great for a rainy day or when your kids are entertaining friends or family. What is the best age for puppetry? Young children usually love puppets as long as they aren’t too scary while older kids might roll their eyes at the very suggestion. 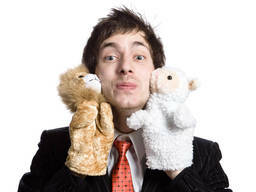 Individual kids’ level of maturity varies so the right age for playing with puppets will probably depend on your child. Most kids (and plenty of adults) will get a laugh out of watching a puppet show even if they don’t want to be the puppeteer. How Can You Organise Puppeteer Lessons and Events for Your Kids? Do you want to find puppeteer activities for kids? The ActiveActivities Directory provides comprehensive details l,you will also be able to find your local drama academy or a puppetry organization which offers puppeterring lessons for the aspiring puppeteer. The school holidays are often a good time to find puppet related activities for kids and puppetry workshops. A puppet show is also a fabulous form of entertainment for kids ’birthday parties. One of the best ways to get your kids involved in puppetry is by making your own puppet and theatre and just playing around. There are plenty of great ideas on the internet for making your own puppets including finger puppets, sock puppets and paper puppets. All it takes is a bit of creativity and a lot of imagination and you can have your own production right in your living room!